Juliette Lewis is on the phone sounding every bit like one of her flirty, fun and yet scary Hollywood movie characters. The topic is not acting or past films with Robert DeNiro (“Cape Fear”), Brad Pitt (“Kalifornia”), Woody Harrelson (“Natural Born Killers”) or Johnny Depp (“What’s Eating Gilbert Grape”). The business at hand is punk rock, the Vans Warped Tour and Lewis’ debut in both as the vampish lead singer of her impressive new band, Juliette and the Licks. The tour stops Sunday at Verizon Wireless Amphitheater. Gates open at 11 a.m.; music begins at noon. Tickets cost $27 at Ticketmaster outlets. 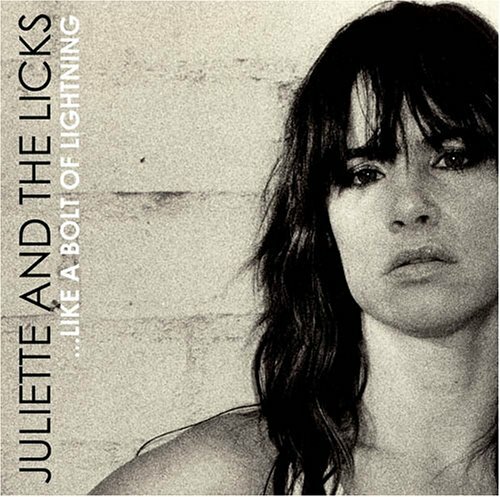 Juliette and the Licks are supporting their debut album, “Like a Bolt of Lightning.” The punchy eight-song album (“It’s not an EP, dammit, it’s a short album,” Lewis said, laughing) is spiced with the sounds of the Stooges, Dead Boys, David Bowie and the Clash. LICK IT UP: Lewis’ debut album was inspired by vintage 1970s punk rock. Juliette and the Licks features H20 guitarist Todd Morse, former Hole drummer Patty Schemel, bassist Paul III and Austin-based guitarist Kimball, formerly of the Rise. The 30-year-old actor, who name-checks Blondie, the Pretenders and Prince as additional influences and speaks favorably of newer acts such as the Darkness and Velvet Revolver, has been fronting Juliette and the Licks for about a year and a half, but has yet to perform in front of Warped-sized crowds. “I’ve never worked in an outdoor venue in 100-degree heat, so I’m hoping to do a good job,” she says. Lewis says putting the band together was pleasantly devoid of the usual actor-starts-a-band doubt and stigma. Can she continue to avoid the rolling eyes that greet most actors-turned-rockers? Judging by her respect for her influences, her real-deal attitude and the rowdy rhythmic romps on “Like a Bolt of Lightning,” Lewis stands to break the mold.